Week 25 – Here’s what happens when you travel with dad. I’m heading to Baltimore this weekend for the next Hay House “I Can Do It” conference on June 21st & 22nd. I hope to see you there! You can register here. I’m live on the radio on Monday (6/16) at 5pm ET/2pm PT and I’ll be taking your calls at (866) 254-1579. You can listen at HayHouseRadio.com. I wasn’t planning on writing a blog about Father’s Day today. But I changed my mind after watching a music video by Peter Gabriel about his father. One of the most significant, influential, and complicated relationships we have in our lives. My father has been with me for the entire time I’ve been on the planet. And it’s a connection that’s affected every area of my life. My relationship with my father set the stage for how I would allow myself to be treated by men. It taught me about what I should and shouldn’t tolerate. My dad also offered me my earliest lessons about how to make my way in the world. He modeled resilience, mental acuity, and a passion for numbers and making money. By watching him raise our large family, I learned to work hard to get things done, to stay the course when the road got bumpy, and to find a small sliver of strength to hold onto when self-doubt reared it’s ugly head and threatened defeat. My dad is a man who doesn’t give up. Some of my greatest opportunities for growth have also come from what my father couldn’t give me. Not because he didn’t want to, but because you can’t give what you never got. Fathers are mortal beings, after all. Too often we place them on pedestals they’re not equipped to occupy. 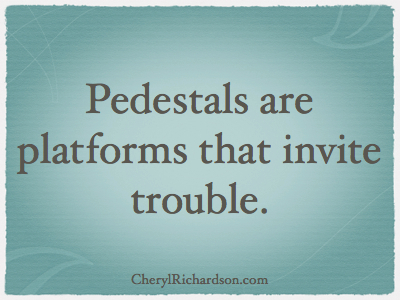 Pedestals are platforms that invite trouble. When we raise people up, we often attach a hidden bag of expectations that can’t be fulfilled. So they fall off and we make it mean something about us. As the years pass and I grow a little wiser, I’ve come to respect and appreciate my dad as a fellow soul traveling with me on this journey called life. It’s good to individuate and level the playing field. To all you men who influence the lives of others in big and small ways, I wish you a happy Father’s Day. And to my own dad, I thank you for being exactly who I needed you to be in order to become the woman I am today. I couldn’t have asked for a better man . In honor of Father’s Day, I offer you this beautiful video by Peter Gabriel called “Father, Son” written about his dad who died late last year. You can watch it here.